Geography Facts For Kids | Cool Kid Facts . Check out some of our cool geography topics! The world is a fascinating and amazing place, and there is so much to explore. Feel free to dive into the various continents that make up our planet, and from there you can explore all of the various countries you want to learn about! Asia is one of the most exotic and fascinating continents, with a rich history and a massive population. Learn more about it here. Australasia is a significant geographic area located in the Southern Hemisphere, and is made up of the continent of Australia, as well as New Zealand and many other islands. Explore that continent that’s not North American and not South America either! A beautiful land that takes in the famous Panama Canal, among other mighty sights. Europe is a continent that is made up of many interesting and beautiful countries. 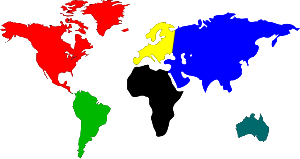 It is close to both Asia and Africa and has a very interesting history indeed. It also has a large and powerful economy. South America is connected to North America via Central America, and has a very long history indeed. It was first visited many years ago by the Spanish and Portuguese in particular. 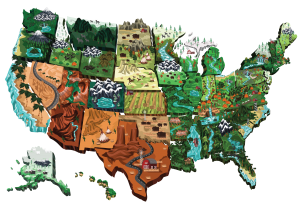 Explore some fascinating and quirky facts about the states of America!